I love it when I can enjoy a food when it is out of season, almost as much or even more than when it is in season, don’t you? Well, plums are a good example of such a food in the Czech Republic and my interest and enjoyment started with švestková povidla. This traditional fruit spread is made from ripe plums full of naturally occurring sugars and, depending on the recipe, may contain spices, vinegar, sugar and even rum or other alcohol. Have a look at some švestková povidla recipes in English. The rich, dark color results in part from the plum skins and the long cooking process traditionally in large pots over an open fire or baked in the oven. The sweet, thick fruit spread is available year-round and delicious on bread, or with cottage cheese or yogurt. It adds a wonderful flavor and sweetness to baked goods including koláčé and perník found at local shops (for example Kolonial Brno). Fresh plums are plentiful throughout this region during the summer and fall, and in addition to povidla, I continue to discover many ways they are preserved and available for consumption all year long. 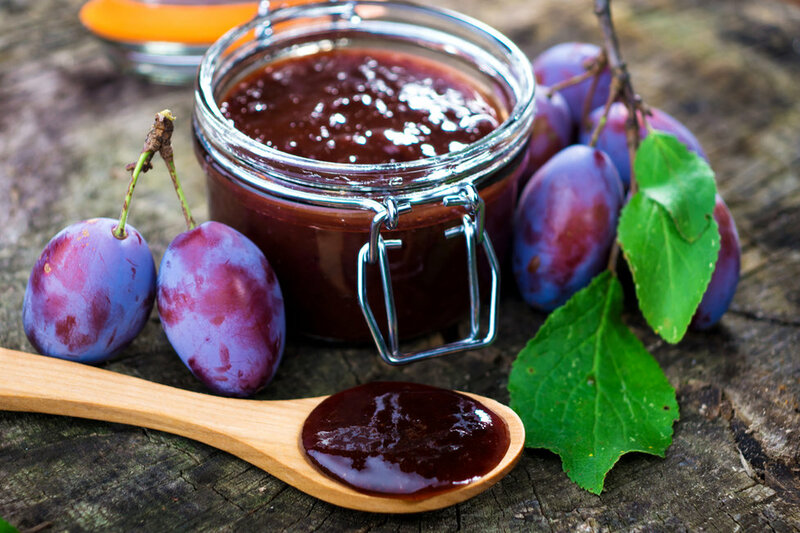 I enjoy plum jam or plum sauce just about any way it is offered to add a tangy sweetness to meat and with desserts such as kaiserschmarrn in Austria. Most recently, I savored it served over pancakes for breakfast in Brno at Bavard cafe a bar. Although I’ve been eating dried plums (also known as prunes) most of my life, I’ve never imagined how delicious they would be when they are covered in dark chocolate, (‘švestky v hořké čokoládě’). Despite its amazing flavor, švestková povidla is not the most notable plum product in the Czech Republic. Moravian plums are well known as the main ingredient in ‘slivovice‘ or plum brandy. The nearby town of Zlín is well recognized for this product of fermented plums that has approximately 50% alcohol content, so consume responsibly. Dried plums (prunes) are well known for promoting digestive health with fiber and naturally occurring substances that may help to relieve constipation. Nutritionally, plums are low in calories and when you eat the skin and flesh, they provide a good source of vitamins A and C as well as antioxidants. If you are plum crazy too, please share the ways you enjoy plums throughout the year! Victoria Hawk is an American Registered Dietitian Nutritionist with more than 15 years of clinical and research experience. She is living in Brno with her husband Jon, who is working here on an expat assignment. Victoria enjoys learning about local foods and plans to share her experience through this blog series.